Home » Food » Food Review: Sushiro at Thomson Plaza | Cheapest Bara Chirashi Don in Singapore? The Place Mention Thomson Plaza and the impression of a last generation sleepy mall comes to my mind. Never did I imagine heading there for Sushiro, a three months old Japanese sushi bar located right opposite the Koufu food court. The space at Sushiro is extremely limited, with just four counter seats and eight table seats to be exact. Done in a no-frills setting, the prices are extremely wallet friendly, judging by the $12.80 Baba-chirashi Don and Salmon Don. Just be warned that queues have starting forming at this small restaurant, and you will likely have to endure the stares from fellow diners standing in line, waiting for their dons. The Food Sushiro promises to dish out fresh Japanese imports, with the exception of their Salmon which is imported from Norway. Expect to choose from a menu of fresh sashimi options, sushi and sashimi dons. You know the restauarnt is proud of its fresh ingredients when you spot a daily menu card updating customers of the specific ingredients which arrives today. 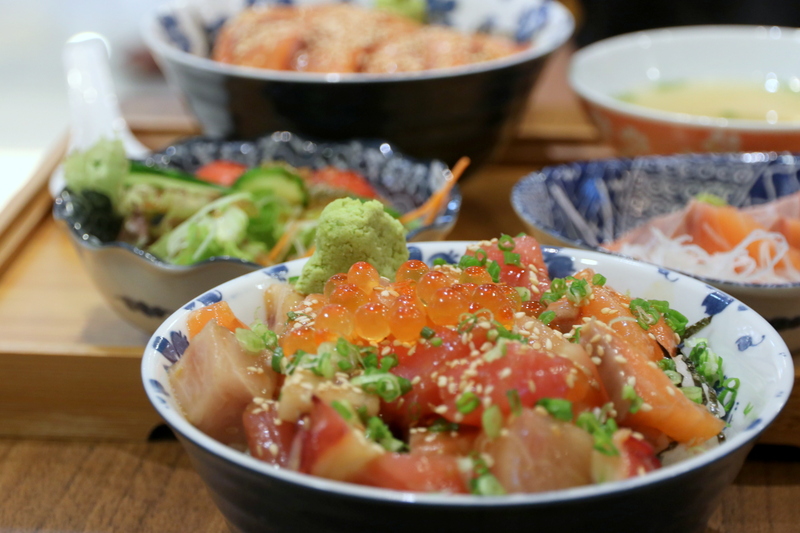 The must try item here at Sushiro is the Bara Chirashi Don ($12.80). Generous portion of the sushi chunks are served with the Japanese rice, making us tempted to give high marks for freshness for the sashimi. For the price, we do not feel shortchanged by the serving or the ingredients as it is something most Japanese restaurants will charge for at least $15. Is this by far the most value for money Bara Chirashi Don in Singapore? Conversely, the Salmon Don ($12.80) was pretty mediocre. The rice was too dry, but thankfully the generous chunks of fresh salmon saved the dish. We were greedy so we thought that the Salmon Sushi Nigiri Set (9.80) should satisfy our peckish souls. The trio of Aburi salmon, Mentai Salmon and Cheese Salmon were shoik if you love your salmon. I love my Tamago and Mentaiko, so it was brainless to order this Tamago Mentai ($3.80). I must admit this is not cheap in relative terms, so skip this if you are not a fan of both ingredients. Rants The small space makes us wonder how Sushiro will manage the the challenges of a growing customer base in time to come. Expect to wait for tables, and a considerable time for your food to be served if the space is running at full capacity. Will I Return Again? Value for money sashimi dons is how we will describe Sushiro, but not so much for the other dishes. The sushi and sashimi prices are somewhat on a par with mass market brands like Itacho Sushi or Sushi Tei, so we will not profess to claim they are more value for money. At the very least, we enjoyed the fresh ingredients and generous portions for the Bara Chirashi Don. Don’t miss out on this humble restaurant if you are in the Thomson vicinity but do order wisely. 7 Comments on Food Review: Sushiro at Thomson Plaza | Cheapest Bara Chirashi Don in Singapore? Just wanted to say – I LOVE THOMSON PLAZA! Yes it’s a reminder of my childhood because it’s one of the last old malls around, and I for one hope it remains forever – Singapore changes enough. I LOVE the ‘sleepy’ vibe here, it’s comforting and nostalgic to me. Bad. Services weree horrible. Hawkers are better. Foods were terrible. Beef pieces more tendons than meats. Chef and staff are arrogent. Will not visit agaiin, ever!. Sad to hear this! Have not head over to their new space since our last visit, hopefully they will not treat their customers like you have mentioned – before losing us all. Sad to hear that. Hope the restaurant do something about it! Wouldn’t be surprised given that it’s so popular!